This puppy is pretty slick. You don't need multiple monitors like it says, works with two computers and one monitor. You do need the ability on the monitor to connect a seperate input from each system. In my case I used DVI and HDMI. Set it up Sever/Client push the mouse off screen to the left (in my case) and switch the LCD to HDMI. Works perfectly. Push the cursor back to the right and switch the LCD to DVI and it is back. Works like a KVM. Of coursre it works perfectly if you have more than one display, laptop or another sytem. Just put them wher you want them in the control panel, top. bottom etc and move the mouse cursor off screen in that direction and you will be working on the other display. 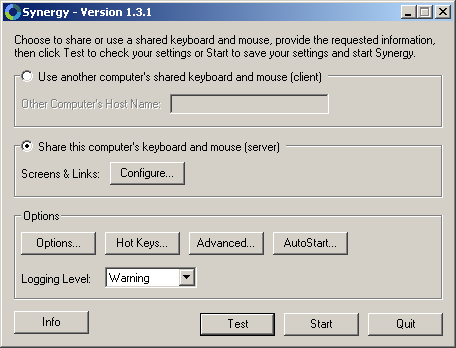 I use Win 7 64 with the 64 bit version of Synergy. - all tried and tested by me. It seems to be working fine for me with win 7. I have a triple monitor setup mac/win7/linux and works like a charm. Version 1.4.2 Beta includes install packages for Windows 7 32 and 64bit. I just installed on my Win 7 x64 desktop and works fine! So this program supports any Windows OS that's at least 10 years old or older. Admittedly, I haven't gotten to try this program, as it won't run on anything newer than Windows XP...but with enough development to carry it into the newer generations of Windows, it just may come in handy to people like me that need a program like this to operate multiple systems from a single keyboard/mouse. No Vista or Win7 support.